By now, we must have been seeing adverts from Etisalat regarding their new offer which is free 1GB of data and 11months of free socialme plan, i.e, free chatting on social media sites like Facebook, Twitter, Whatsapp, Instagram, 2go, BBM for the next 11 months. 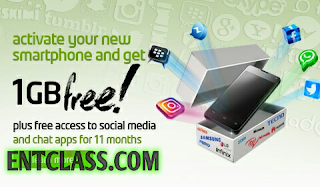 This offer is only available for new smartphones that is activated with Etisalat sim. Unfortunately, there won't be any kind of Imei tweaking for we old smartphone users to enjoy or partake in this ongoing offer from Etisalat because Etisalat don wise up small. lol. This offer is activated using PIN. You will need to purchase a new smartphone either from Etisalat experience center or from a phone store, there is a PIN you will see on the pack of the phone which you will send to Etisalat for them to activate your Sim for the offer. Once you are successfully activated, you'll be given 1GB free data to browse your favorite sites. HOW CAN I ACTIVATE A NEW DEVICE TO GET THE OFFER? When you buy a new device from Etisalat experience center, their staff will activate it there for you free of charge. But when you bought the device from another phone store, all you need to do is locate the PIN inside the new phone box and send the PIN found on the device box to 8186 or by dialing the USSD code *8186*PIN#. HOW CAN I ACTIVATE THE FREE SOCIALME PAK? 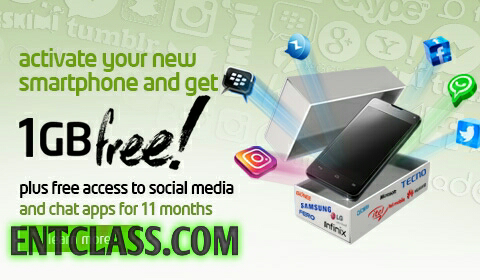 We the old smartphone users won't be eligible or partake in this offer from Etisalat.